For this months HWA meeting my challenge had been set as a candle snuffer. I had already made one, exactly as it had been shown in the instructions I was given.But the second candle snuffer I made, I decide to make articulated. This was really challenging, but I was determined to do something more interesting. 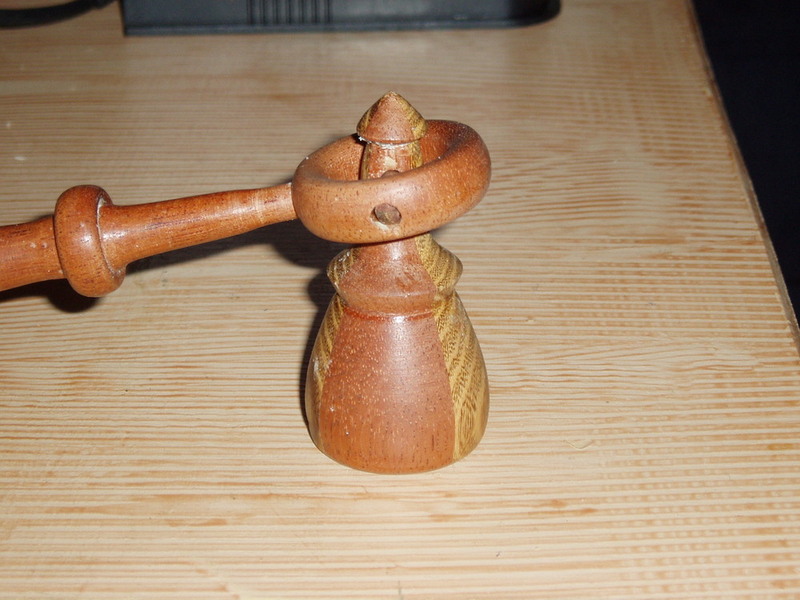 The idea was that if the challenge of the candle snuffer project is to get it sitting flat on a surface, getting the angle between handle and bell correct. Then the obvious solution is to make it articulated and hence always be able to achieve that angle. To do this I made it in 4 parts. Handle - pretty much as before, I decided to make the handle reflect other parts of the design. So the end was shaped to a similar profile to the bell, and a bead around the handle was intended to reflect the ring used for pivoting the bell. Bell - I actually made this from 4 sticks of 2 different colours stuck together, such that like colours where on opposing corners. I was worried that it would be difficult to centre, but it actually came out perfectly. The design for the bell piece had a long narrow top, that would ultimately have a pivot pin pass through it. Ring - This needed to be large enough to have the tip of the bell pass through, with room to move, But small enough to feel in proportion with the handle and bell. Pivot - this was just turning down to a thin stick that was as long as the rings diameter. Subsequent attempts largely failed, I eventually realised, because the laburnum I was trying to use was simply too open grained to hold such a fine shape. Once I moved to a very closed grain wood, I finally got it right. The pivot was slightly tapered, this wasn't entirely intentional but was ultimately a good thing, as it meant I could make the hole on one side of the ring slightly larger than the other, and peg the pivot in place fairly easily but into a tightening fit. After several attempts at the ring I think I got the right sequence to shape it and drill holes. First I shaped the outer ring profile, then bored, end grain, to hollow it whilst leaving it still attached. At this point, I took it off the chuck, and used the main body of wood to clamp it in my drill press. Here I could drill the hole for the pivot and a recess for the handle to fit into. If I screwed up here, I hadn't wasted tool much time sanding and finishing. In one attempt I tried to drill before bothering to hollow out the ring, However that made it much harder to get the pivot holes nicely centred. Having drilled the holes, and hopefully not made a mess of it, I could rechuck the piece, and begin sanding and finishing the ring shape more, This also means you clean up the edges of the holes just drilled. I had to widen one of the holes for the pivot pin, since it was wider at one end than the other. This works well, as I didn't need to glue it in place, and while the final fit is quite firm, there was no need to tap it into place with a hammer. Which is what has caused my first attempt to split. It also means that it is relatively easy to disassemble should I want to. As ever I was far more excited about making it, than the thought of writing about making it. So I failed to take any in-progress pictures. Hmm last picture is a bit rubbish, but it's taken me 2 weeks to get as far as adding pictures to this post, so it will have to do.